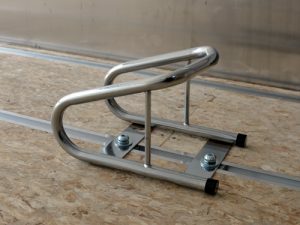 PROLine enclosed motorcycle trailers come standard with our unique Quick Adjust Floor Rail System. 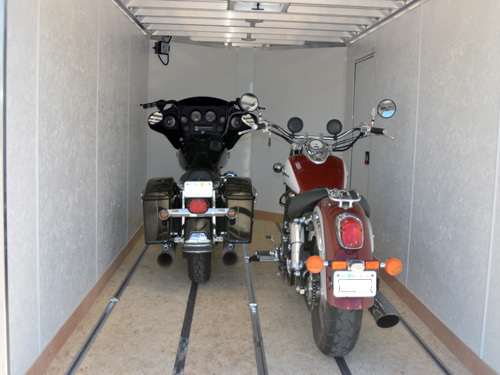 Trailers designed for a single motorcycle (5′ & 6′ wide models) come with three floor rails and trailers designed for two or more motorcycles (80″ and wider) come with 5 floor rails. This system allows you to determine where your motorcycle goes to have a perfectly balanced load for every trip. 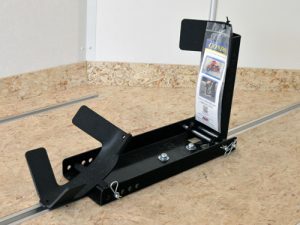 We carry three types of wheel chock that work with our Quick Adjust Floor Rail system. 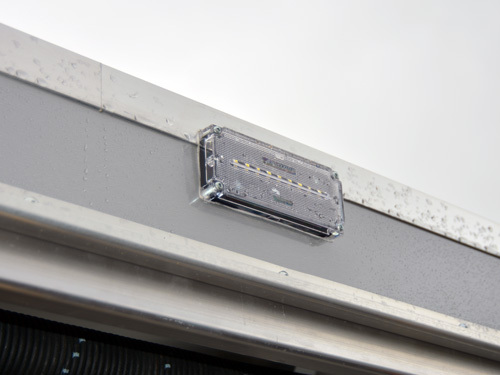 The most secure chocks are the Condor™ Chocks by TCDD Inc. The Condor chocks are an adjustable wheel locking system for all motorcycles with wheel sizes ranging from 14-22″/ 80-230 wide. 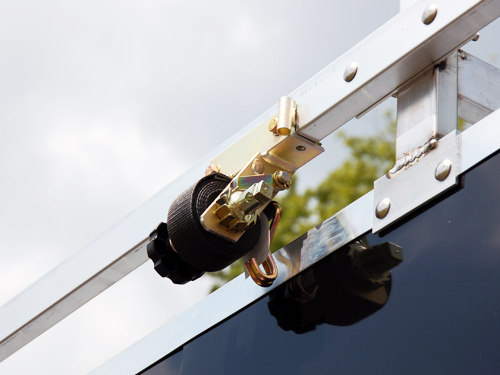 The locking mechanism effortlessly and securely supports your motorcycle in an upright position in the trailer. With the Condors™, tying down a motorcycle becomes a easy task for one person. You will be amazed at how secure and safe your bikes will be once tied down in a Condor™ Chock. 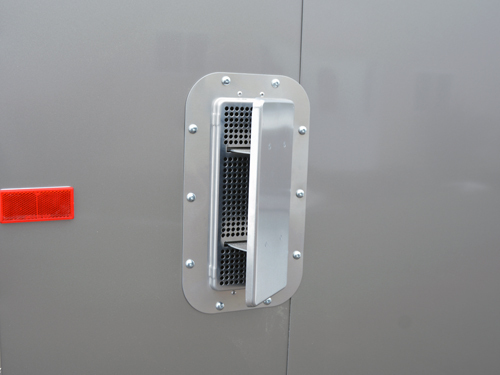 The Condor™ chocks are available in an aluminum version (PS1500) or a steel version (SC2000). 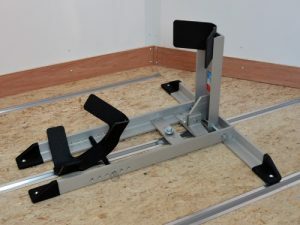 The PS1500 can be used in or out of the trailer due to the stabilizing wing on the front of it. 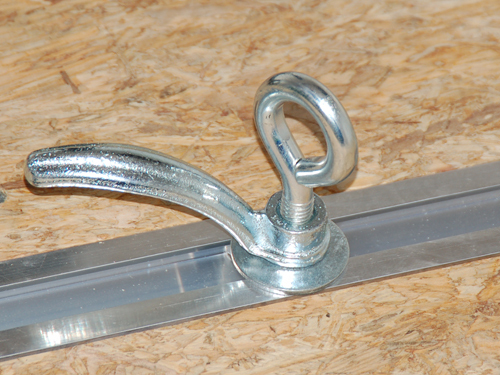 For a less expensive option, we also offer a basic tubular chrome chock. No matter what chock you choose add a few Quick Adjust D-Rings or Eyebolts to complete any of these tiedown packages.